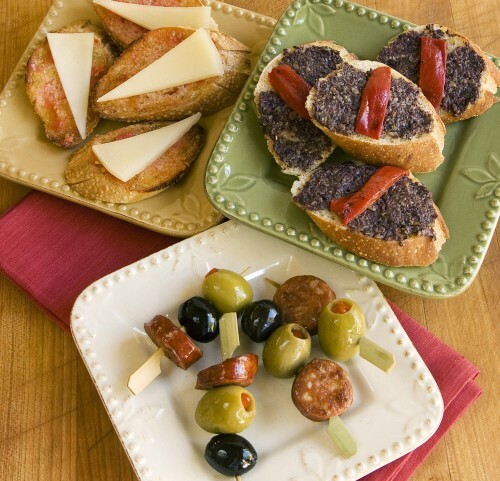 Spain’s famous finger foods, are delicious and incredibly versatile for winter holidays or any time of year. Tapas are great for parties, as everyday teasers before dinner, or even for midday snacks. Ingredients can be mixed and matched, or served alone, such as thin slices of Serrano ham, whole almonds, small wedges of cheese, or an assortment of olives. The flavor combinations are sensational and the possibilities endless. Here are three super-easy tapas that use seasoned rice vinegar for a tangy flavor boost. Look for more of my tapas next week — Patatas Bravas and Gambas al Ajillo! Allow one hour for sausage to marinate in the rice vinegar. Start with fully-cooked links of Spanish chorizo. * If chorizo is not available, use Portuguese linguica. Cut sausage into 1/3-inch thick slices, and fry over medium-high heat until browned on both sides. Cool 5 minutes then remove from pan and place on paper towels; pat tops with paper towels to remove a bit of the fat. Place sausage in a shallow bowl and generously sprinkle with seasoned rice vinegar. Cover and let stand 1 hour. Drain sausage and thread onto to toothpicks along with an olive or two. *One 3-1/2 oz link will make 10 to 12 slices or tapas, or 20 tapas if slices are cut in half. This is especially easy if you use store-bought roasted red peppers and tapenade. Both can be found near the olives and pickles. Drain peppers and cut into strips. Place on top of the bread along with some tapenade, black olive or green, or a combination. Splash with seasoned rice vinegar; roasted garlic flavor is especially compatible. Tomato bread is a traditional home-made snack that originated in Catalonia and is now a regular offering at tascas and restaurants across Spain. The bread is often rubbed on both sides, but one side works well when using seasoned rice vinegar. Also, the more flavorful the tomatoes the tastier the tapas. Cut small ripe tomatoes in half; rub the cut side over slices of lightly-toasted or day-old crusty French bread. Drizzle bread lightly with extra virgin olive oil and seasoned rice vinegar. 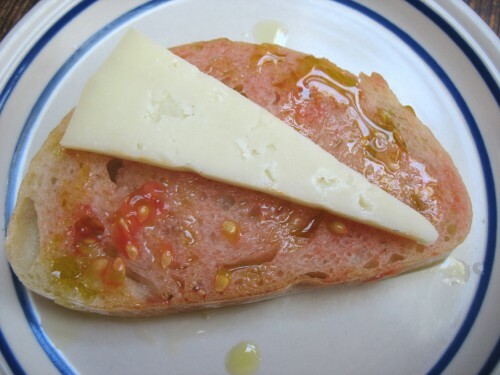 Top with a thin slice of Serrano ham, or Spanish cheese such as Manchego, Ibérico, Cadi Urgelia, Gallego or Tetilla.